This addictive dish, full of greens and proteins, is one for the books! The miso vinaigrette takes this dish to a whole new level of flavor. A definite "must try" recipe! Preheat oven to 375 degrees. In a medium bowl, mix 1 cup cooked rice with 1 tablespoon olive oil. Spread on a large rimmed baking sheet. Bake for 15 to 20 minutes, until crisp. Meanwhile, in a large skillet, heat remaining 2 tablespoons of olive oil over medium-high heat. Add the bok choy, cut side down, and season with salt and pepper. Cook until browned on the bottom, 2 to 3 minutes. Flip and cook until crisp-tender, about 2 to 3 minutes longer. Transfer to a plate. In a bowl, toss the crispy rice with the remaining 3 cups of cooked rice and 1/4 cup of the vinaigrette. 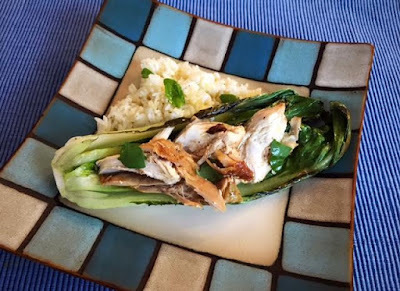 Transfer to shallow bowls and top with the bok choy and chicken. Spoon the remaining vinaigrette over the chicken and bok choy and garnish with basil. Enjoy!